Success after 40. Many believe that if you’re not super successful by 30 or 40, there is no hope. Well, recently I turned 40, so I choose not to believe that. Truth is, I never even imagined as a teenager what it would be like to get to this age. I also (mistakingly it would seem) thought I would have life figured out by now. That I’d be super successful. And all the rest. And from the outside – to a few – it might seem that way. Well, who knows really? It’s all a journey and there is plenty more I want to do. 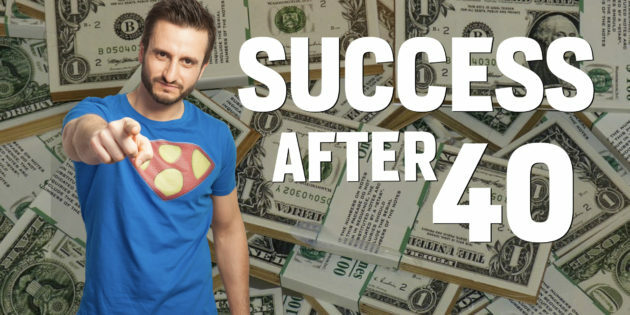 The point of this post though really is to remind myself and all those of you out there over 40 that most successful people are over the age of 40, 50 and beyond. We read about the 23 year old billionaires in the newspapers because they are so rare. Let’s look at a few famous and successful people who reached their success after 40.
worked as an engineer under Thomas Edison (the inventor of the lightbulb, and founder of GE), where he worked on ways to improve the then new automobile. It was not until he was 40 that he founded the Ford Motor company, where he introduced the Model T five years later. left the House of Representatives at aged 40 and went back to practicing law, his young political career seemingly over. He jumped onto the just-founded Republican Party seven years later, and then was elected President of the United States four years after that. ran several stores, and failed many times in the process. But he learned from those failures and used the lessons to open the first Wal-Mart at aged 44 and become one of the richest men in the world. His children (if you were to total their assets) would be the richest family on earth! was a figure skater and journalist before entering the fashion industry at age 40. Today she’s one of the world’s premier women’s designers. was 43 when he hit it big with the film “The 40-year Old Virgin”. was 46 when he hit the big time in “Pulp Fiction”. worked as a travelling salesman for a milkshake maker. Then at the age of 52, he met the McDonalds brothers and liked what he saw. Especially their process. He “convinced” them to sell it to him eventually, and gave the world the (ahem) blessing that is McDonald’s and junk food! worked a variety of odd jobs throughout his life. When drawing his social security checks he realised it wasn’t much. He ended up trying to sell his famous chicken recipe (with 11 herbs and spices) into diners, but none wanted it. (He tried over 1000! Got a yes on the 1009th!). He later created franchises out of his recipe and by 1964 had 600 of them! went on his famous voyage on the HMS Beagle at just 21, but his work as a naturalist was held back by health issues. It was not until he was 50 that he finally published On the Origin of Species. So you see? You can still make your mark, whatever your age. was 66 when he entered his finest hour in World War II. Had he passed away at 65, it’s likely that (1) we would never have heard of him and (2) you wouldn’t be reading this – the world would be very different! I hope that inspires you to keep going regardless of where you are and what you think you should or shouldn’t have done by now. Social media can really warp our perceptions of what’s really going on. And what we should be achieving. What do you think? Who are your favourite late bloomers?